I realized today that we neglected to document (blog-ument?) 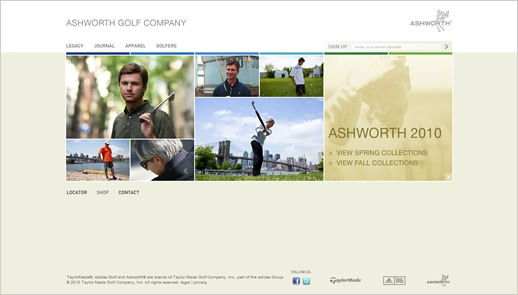 the launch of another site a week or two ago : the redesign of the Ashworth Golf Company. Using WordPress at its Content Management System potential, the site showcases the Ashworth legacy, latest Apparel, Golfers, and then some. 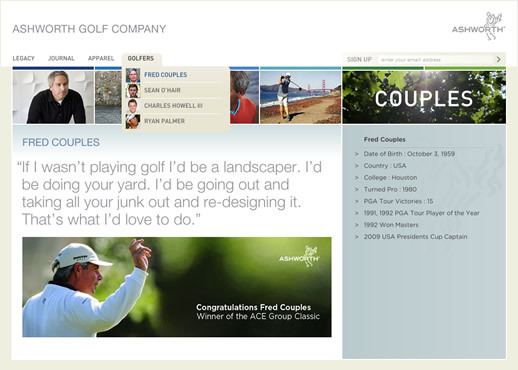 Using the NextGen gallery plugin, combined with Craig’s photoshop skillz, the Apparel sections become super easy both to admin, adding new images with a few clicks, and view, as if you are looking at the printed catalog in your hand? And who wouldn’t be stoked to build a new home for a set of pro golfers who, just in the course of us building the new site out, won the ACE Group Classic and the Sony Open in Hawaii?